When I stood up from the couch I thought. I’m tired of everything being practice. Each character sketch, each poetic fragment, each novel attempt, each theory, each relationship, each parenting moment, each breath. All participated in as if the engagement might provide benefit, as if the pain will promote healing, as if the mistakes will prove corrective, as if fitness might improve health. “Lifelong learning” – how nice it sounds, how endless. But learning for what – ? There’s just more life until… and then it’s probably simply (well, complexly) variantly continued – one situation hardly informs another – for the next now the context has changed, as well the elements, the matter, the flow. So then I think again – perhaps it’s fear. That lifelong learning, or anything meta- entails a splitting off – a doing WITH the observation; and thinking WITH reflection; the subject’s objectification. A remove. And so it feels like practice rather than NOW. 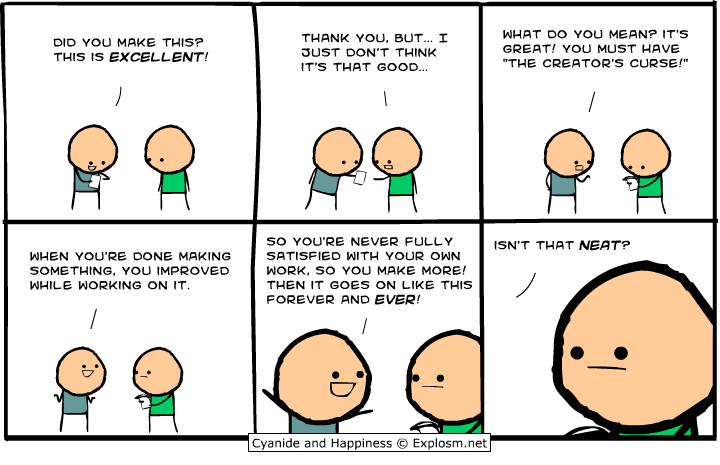 – The “Creators Curse” from Cyanide & Happiness. In our making we extend and become in the risking required to attempt…to craft… to work… so it cannot end, for if we grow or move or change (which we will) the work will need to go farther, be finer, account for those fluctuations… ever stepping into new, fresh, dynamic, complex realities… PRACTICE IS IMPOSSIBLE. But if we turn and try to bring the effort up to speed, in that turning, that editing, that effort, nothing stops. Nothing stops moving into that next moment, next ream of realities, heart-beat’s context, juggling atoms and muscles and breath… “Improvement”? Who knows. But different for sure. And even if we reach and stretch toward the work we imagine versus the work we are capable of…it all changes in kind…as change. In optimistic moments this is cause for hope. The possibility that something might improve, benefit may come, a temporary health could be achieved. But not achieved only altered. And not altered only changing. I’ve argued before that we must lose our tenses to be honest to living – everything must become verb. But I don’t want anything to be practice anymore…rather maybe process – doing, making, saying thinking in or with … everything. I want to be : living, writing, parenting, loving, doing, making, saying, thinking NOW and HERE as IS. Yes, being present. I wish I had more to add other than that I also want that, now. I look at what I do as trying. Try and try and try. Sometimes, those tries will work — as in a parenting moment that I think worked out well, or a finished piece I created (illustration, poem, fiction, etc.). Sometimes, those tries fall well short of what I hoped for, and so could be labeled “mistake” or “failure.” But those failures to reach the destination have been great learning potentials. And I’ve learned that the frustration that comes with them is part of the bargain. Also, some of those tries lead to surprises. In creating things and otherwise. Those surprises are delightful gems to hold onto and remember when the frustrations and failures appear. Jade. Jaded.used to be to make immortals of us. Green mask, green breatplate. Now verb adverb. We lack lustre.grow weak.taste dust. The cloth has worn thin on our fine designs.,look carefully through: something else moves beyond. Excellent post. And an excellent cartoon! This is what the German philosopher Helmuth Plessner in his philosophical anthropology called “excentric positionality”. We are always a bit outside ourselves. Animals, on the other hand, are “centric”. But this “curse”, as fatiguing as it sometimes might be, is what it means to be human. If you stop it, you would stop changing and end up being an algorithm, describable completely in a finite set of rules. …plus the discussion in the comments. Lately these concepts have gotten all entangled with my Taiji practice and my thoughts on my practice (yes, my “meta-practice”!). I think often about the word “practice”‘s dual nature. Practice in the sense of reiterations of an activity in order to “get it right” versus a more buddhist/taoist concept of “a practice” — a word simply for “what one does as a practice” as a “method.” Of what? Well, I guess you could say “being.” I think this is perhaps where the word “process” fits in nicely as an alternate for the same concept. Thank you for this post. These things have been constellating in my head for weeks (years really, on and off, but on much of the time lately). Thank you for your sustained attention and comments and extensions. I very much support your usage of “practice” – but it does oscillate, or perhaps in a way they ARE the same thing – i so often use “processes and practices” as a unit. I appreciate the links and the thoughts following, and just a few posts ago I think I wrote about how glad and promising it is to ever be “unfinished.” Today I was tired, perhaps of simply not giving it all – and here is where your sense of “practice” instructs – “practicing the present moment” would hold lightly past-present-future flow – the longing for “finish” or “completion” or “conclusion/resolution” and bring ALL to the present, no? THAT is what I want to “practice” – writing as writing ALL I have in this moment of action. Rather than withholding from doubt or fear or a sense that there will be more tomorrow, or next month…when those are not. Here’s to ever being unfinished! Quite, quite true. There is that which we WANT to be, and that which life REQUIRES us to be. The struggle to balance the two is constant, and some days–for me, most days–the latter comes out ahead. But the fact we don’t relinquish that want completely, the fact we don’t bury it, come back every now and again with a handful of flowers to reflect and reminisce…that, there, is how we know the want will survive all that life demands of us.